Ruth Hogan's debut novel is set in England, some time after the Second World War. Most of the time it does not feel contemporary, although there are occasional references to technology that show the novel is set in the present day. The story omits much reference to politics, modern culture or language, or even specific location, although London seems the likely place. There are references to shops like Marks & Spencer's. Narrators use words like "knickers" for women's underwear, which is a little dated. It seems meant to appeal those who yearn for an apolitical English world with mildly amusing quirks. Yet there are plenty of stories with women in unhappy marriages, planning to get out. There's also a central character with Down syndrome, who stands up for her own rights and is charming in her directness. That attitude towards people with disabilities feels more modern. Large sections of the story are set in the past, filling out the details of the characters' lives. There are at least two separate plot lines that eventually come together. 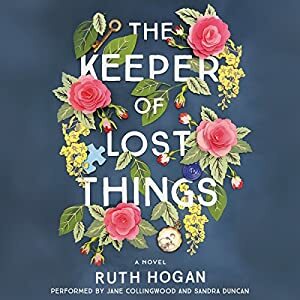 Laura befriends Anthony, an older man who is the keeper of lost things of the title. He collects items he finds and he writes stories about them, which are published with surprising success. When he dies, he leaves his house to Laura with the condition that she devotes her time to reuniting the lost items with their previous owners. The other plot line is set more in the past, with a love story between Eunice and Bomber. Bomber is a publisher and has a difficult family, and especially a horrible sister. We meet Eunice every few years, as her life develops. This side of the story is livelier, but also more caricatured. It takes some focus to keep all the different characters in mind. Hogan's writing has a skillful use of phrasing, with many striking similes. She portrays a world of people who are privately unhappy but occasionally find real love. It's a combination of some home truths about the world with a mild sentimentality, and it's pleasing. There are two performers identified for the unabridged audiobook, Jane Collingwood and Sandra Duncan. A person with a distinctively male voice appears in the audiobook, and there are at least two female voices, so there's some suspicion that a male reader hasn't been identified. Collectively, it's a strong performance.